Right. A post about a bodhisattva called Avalokiteśvara, and his relationship to my godawful printer. 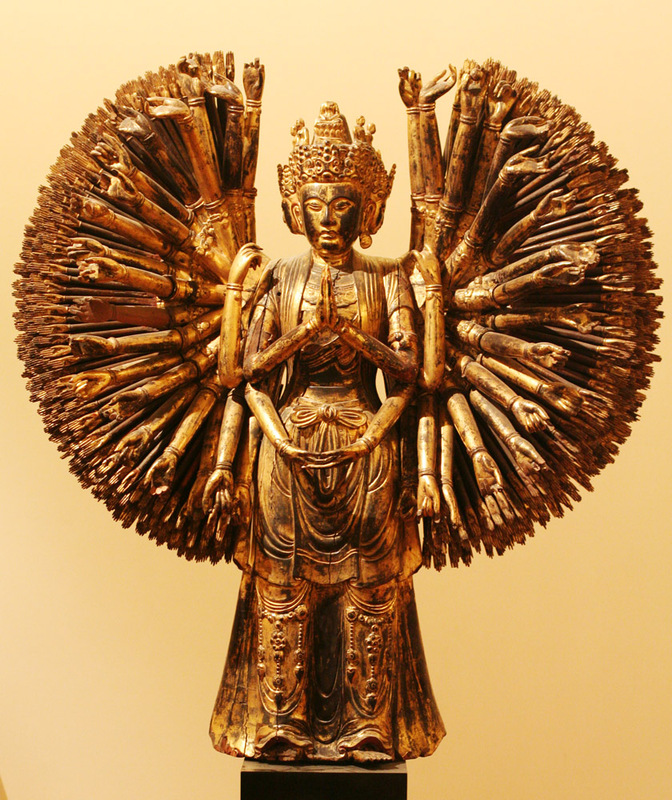 Avalokiteśvara embodies the compassion of all the Buddhas, which, I'm told, is one hell of a lot of compassion. At least a metric ton of the stuff. Ava means down; lokite means looking; and vara means lord. So Avalokiteśvara is the Lord Who Looks Down, and the thing that he usually looks down upon is human suffering and lamentation. That's why*, when the Chinese took up Buddhism they rendered his name as Guanshiyin which means He who perceives the lamentations of the world. This brings us to the utter and delightful insanity of the Chinese name taboos. There was, of late, a popular bumper sticker in America that said "The only Bush I trust is my own". There were other such witty variants. The idea was that by using the president's name in some amusing context you make the president himself look silly. What George W. Bush should have done (and would have done had he come to me for advice) would be to make it illegal on pain of decapitation for anyone ever to use the syllable bush. That would include ambush, bushells of wheat and, of course, bushwhacking. That way nobody can make a rude pun about you. This policy was pursued by the Chinese emperors of old. There was an absurdly liberal emperor called Shimin who said that you only needed to avoid saying shimin, and that Shi and Min on their own were all right. He even went so far as to employ a chancellor called Li Shiji, which shares a whole syllable with his name. Fortunately for the dignity of the imperial office, his son repealed the law, had it include the last seven generations of emperor, and made the chancellor change his name to Li Ji. Nobody in China was allowed to write the syallable Shi. This had obvious consequences for our bodhisattva Guanshiyin, or Guanyin as he was called from then on. It should perhaps be noted at this point that Guanyin is rather androgynous. 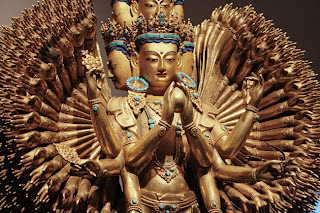 Though Avalokiteśvara is usually a he, Guanyin is usually a she. 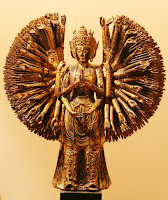 And it was in this feminised form that Guanyin arrived in Japan, where her name was altered slightly to Kwanon, which sounds similar if you think about it. This brings us inevitably to the invention of the camera. In 1934 a Japanese fellow by the name of Goro Yoshida started manufacturing 35mm cameras. 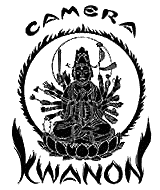 He decided to call his company after the all-compassionate bodhisattva, and so the Kwanon camera began. Here's an original logo. Kwanon started to do rather well. They cornered the Japanese market and then started trying to sell their products in the West. However, we westerners find Kwanon a bit of an odd-looking mouthful. So the poor bodhisattva (who, you will remember, had already lost a shi to an emperor) was stripped of her W, and had her K changed to a C.
That is why you can still buy Canon cameras to this day. You can also buy Canon printers that break down and run out of toner and jam their paper and take hours to print or cancel. However, once you know that, ultimately, Canon means Hearing the Screams of Humanity, this suddenly seems rather appropriate. So why is my printer not handy to use? *Although there are some rather dull complications to this. The Oatmeal on printers, and why they're from hell. That is why you can still buy Canon cameras to this day. You can also buy Canon printers that break down and run out of toner and jam their paper and take hours to print or cancel. Great article, by the way. Thoroughly enjoyed it. Thanks for the well chosen illustrations. Thank you both for the corrections and clarifications.